In 1871, three years after the railroad had arrived in Green River City, a fellow named Thomas Moran stepped from a railroad car at Green River. It was reported that he found an instant fascination with the west and the eroded cliffs surrounding the Green River, of which he made the first sketches of his journey. Moran was 34 years of age at the time and was in route to Idaho to meet a Dr. Ferdinand D Hayden who was about to make his survey of the little-explored country of the Yellowstone for the United States government. 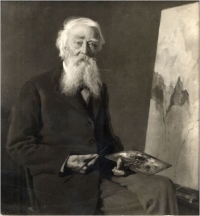 Also with the expedition was another soon-to-be-famous artist, William Henry Jackson, renowned photographer of the westward movement. In addition to his sketching, Moran worked extensively with Jackson on his photography. Moran's "first sketch made in the West" was of Green River's toll gate rock and the palisades just west of the town. Using these sketches and others he made on subsequent trips, he produced several well-known oil and watercolor paintings of the area during his artistic career. He revisited this same subject time and time again, it being one of his most popular scenes. He escaped duplicating himself by showing the scenes under different conditions and moods. It was reported that no two Green River pictures were ever exactly alike, although their one constant was the looming cliffs of the Green River valley. His popular "The Cliffs of Green River" was painted in 1874. His final painting of the scene was made in 1918 when he was 81. Moran's importance to the promotion of the West is indicated by the fact that Hayden named Mount Moran, the largest of the three Grand Tetons, after his friend and colleague. In time, a bay, a canyon, a junction, and even a small town in that vicinity would bear Moran's name. Moran was born in 1837 in Bolten, England. He and his family immigrated to the United States in 1844, taking up residence near Philadelphia. In the latter part of 1880, Moran had set up a studio in New York where he often was found still painting versions of the Green River scene. His life came to an end on August 25, 1926, in Moran's 90th year. Today, Moran's work is rare and in great demand. Dealers admit their inability to locate sufficient pieces by Moran to satisfy the wants of the public. Most of his work has found its way into private collections, where it remains inaccessible. It had been reported in past years that some 200 Moran oils had been located, with some 70 of them being in museums and other public institutions. No doubt there are many others. For more information about Thomas Moran in Green River, contact the City of Green River at (307) 872-6136.